Eliza, of the blog The Painter's Wife, has teamed up with the entrepreneurs/mompreneurs whose products she had been raving about and is giving away THREE GOODIE BAGS (composing of at least P3,000-worth of fab products)!!! You can join by blogging about it, tweeting about it, adding as Multiply friend, referring friends to the blog contest (so please, if you learned about the contest from me/here, don't forget to include my name "Mec Arevalo" as the one who referred you so I can get an extra entry point while you earn yours) or liking the sponsors' FB pages. 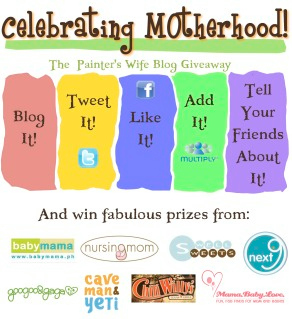 Just click on the link above to take you to the Painter's Wife's contest page!